Skymark Airlines offers all-premium A330s on domestic routes. It could only work in Japan? Few airlines have made all-premium cabins work, with the list of withdrawals ranging from fly-by-night operators to Singapore Airlines' withdrawal from its non-stop A340-500 New York and LA services. But Japan’s third-largest airline, Skymark, is looking to buck the trend by using all-premium A330-300s on trunk routes in the domestic Japanese market. Skymark only operates domestically at present, although regional and long-haul destinations are on the cards. The plan is not as foolhardy as history suggests. In fact, Skymark Airlines may have one of the best chances of succeeding in the all-premium space. “All-premium” has generally meant business class, for most of the attempts have been in this cabin. But Skymark is effectively planning an all-premium economy cabin, seating 271 in an A330-300, compared to 116 that Hainan Airlines tried on A330-200s and only 100 on Singapore Airlines’ A340-500s. Skymark wants to differentiate itself in the high yield domestic market from ANA and JAL, which have cramped domestic cabins (despite averaging below 70% load factors). Combined with Skymark’s significantly lower operating cost, its proposition may find healthy traction. The latest carrier to end an all-premium cabin experiment is Hainan Airlines, which took sister carrier Hong Kong Airlines’ three A330-200s configured in 34 lie-flat seats and 82 reclining business seats. The aircraft in Mar-2012 were deployed – hastily – in the Hong Kong-London market. With little feed at either end, load factors were consistently low and around the middle of the year the carrier announced its suspension of the route. After deliberation the aircraft were transferred to Hainan Airlines to be used on trunk routes within mainland China. Hainan Airlines launched all-premium A330 services between Beijing Capital Airport and Shenzhen on 28-Nov-2012, some two months after the aircraft ended Hong Kong-London Gatwick service with subsidiary Hong Kong Airlines. The aircraft have not been reconfigured. Hainan in Dec-2012 accounts for about 16% of seat capacity on the route. In addition to its double daily return premium services, it typically has about two other return frequencies, operated by A340-600s or A330s with economy class seats. The largest carrier on the route, Air China, has about double Hainan's capacity. Air China accounts for about 34% of the market but with upwards of nine daily services, giving it a significant frequency advantage. Services are operated by Boeing 737s and a range of widebody aircraft, some dedicated domestic/regional aircraft and others used in between long-haul services. Air China's position is further enhanced by the presence of Shenzhen Airlines, in which it has a majority 51% stake. Shenzhen Airlines accounts for about 25% of the Beijing-Shenzhen market. Shenzhen only flies narrowbody aircraft, but that includes the large 737-900. But this too did not succeed and Hainan now plans to re-configure the aircraft. Later in 2013 Singapore Airlines will withdraw the five A340-500s operating non-stop from Singapore to Los Angeles and New York Newark. The major all-premium operation still existing is from British Airways: a London City-New York JFK service and its OpenSkies service from Paris to New York Newark. Skymark’s all-premium plan is distinctly different. The aircraft will be closer to a normal multi-class configuration than all-premium predecessors. Indeed, at 271 seats on Skymark’s A330-300, the aircraft is on par with other operators' configuration. Within Skymark’s region of North Asia, Asiana fits 296 on its A330-300 and Korean Air 276 in a three-class A330-200. In a more dense domestic configuration, Air China fits 313 on its A330-300. The denser configuration means Skymark can stimulate greater demand; the product will have mass-market appeal owing to its lower cost. Skymark is tentatively naming the product "Green Seat", after the more spacious seats offered in the "Green Car" on the shinkansen, Japan's high-speed railway (although this term and concept is falling out of favour). Many earlier all-premium attempts have been hindered by the high cost of fuel on long-haul flights. That long-haul strategy not only exposed carriers to higher costs, but also competitors that could offer a one-stop product, either with greater frequency and/or lower price. Skymark’s initial plan to use the A330-300s on domestic routes lowers its exposure to fluctuating fuel costs. The first route is due to be Tokyo Haneda-Fukuoka, which is Skymark's busiest route based on available seats, Japan's second and the world's third - and a distance of less than 900km. 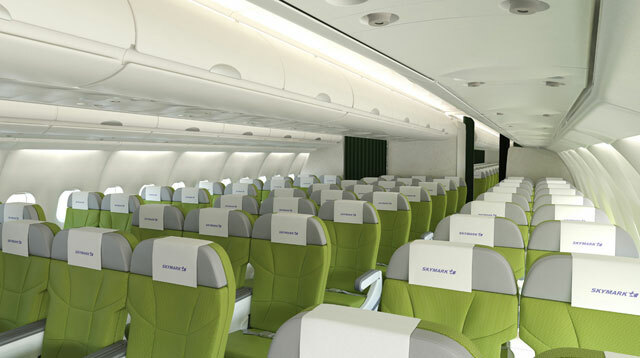 At closer look, Skymark’s all-premium A330-300 may seem like a slightly more spacious economy cabin. Instead of the typical eight-abreast economy 2-4-2 configuration, Skymark will have seven-abreast in 2-3-2, removing one seat per row. Pitch will be 38" compared to a long-haul standard of 31-34”. But in the context of the Japanese domestic market, Skymark’s offering will be a very spacious product. 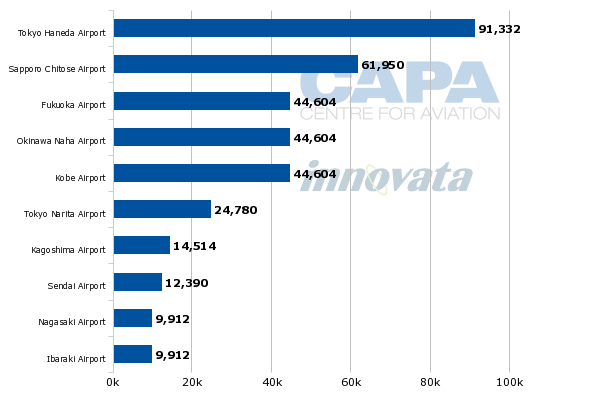 All Nippon Airways and Japan Airlines, the largest and second largest domestic carriers respectively, have very high density aircraft. Indeed, in the 1990s they launched – and were the only operators of – a domestic version of the 747-400. Space is typically at a premium in Japan even though – or consequently – personal space is highly prized. And, it should be noted, the Japanese are not the tall Dutch and nor are they like Tongans, whose girth has become sufficiently problematic that Samoa Air now charges fares based on weight for "XL" passengers. There is precedent for the market looking for extra space. On domestic flights, the premium offering (Class J on JAL) can be only slightly more than economy: USD193 for a one-way Tokyo-Sapporo in premium or USD166 for the same flight in economy. The major difference is a more spacious seat; there is no full meal or bar or lounge access. Skymark with its current all-737-800 fleet has a lower yield on average than ANA and JAL. While Skymark will want to compete with ANA and JAL’s domestic premium product, its cost base and product positioning should allow its premium seat cost to about match ANA and JAL’s regular economy seat cost. Also, the A330-300 offers greater scale than Skymark’s 737-800 and is a lighter aircraft than the 777s and/or 787s used by ANA and JAL, further working to Skymark’s advantage. Skymark is looking to increase its share of traffic and has made other changes, including introducing very flexible tickets to woo corporate passengers. Although ANA and JAL have their loyal followers, Skymark is benefitting from a growing mentality in Japan that ANA and JAL have been too expensive; a third and new airline option is being welcomed. The differentiation also comes as LCCs with lower cost bases than Skymark set up in Japan, although so far none are flying domestically to its main hub at Tokyo Haneda, the convenient downtown airport that offers a yield premium over farther-flung Tokyo Narita. The premium A330s present a new value option to the market, and could keep or recapture any customers who were contemplating or have switched from Skymark to the new LCCs. Skymark has said it has seen some passengers go to LCCs but has not given any estimates. In an over-simplified academic analysis of Skymark’s potential advantage, filling its A330 with a 70% load factor at its average yield and CASK would result in a profit of about USD9,200 per flight while an ANA 787 at a 70% load factor would see a profit of about USD14,000. But the numbers come into focus when considering ANA's average CASK is flattered by the more efficient nature of its long-haul flights. Stage-length adjusted, Skymark holds an even greater CASK advantage than average figures suggest. Skymark’s advantage increases significantly if it boosts load factors above 70%, which it does on trunk routes, (although management has indicated it anticipates a 60% load factor in future for the A380 at least). If the product gains traction and Skymark continues on its efficient path while ANA and JAL remain around their cost base, it is not inconceivable for Skymark's A330 to rival ANA or JAL financially. Skymark is based at Tokyo Haneda, where about half of its seats operate to or from. Its largest routes are some of Japan’s – and the world’s – largest routes. Outlook: an all-premium option that may just work – but only in Japan? Could Skymark’s configuration find its way to other markets? That is a big leap to make even if Skymark’s plan sees success. 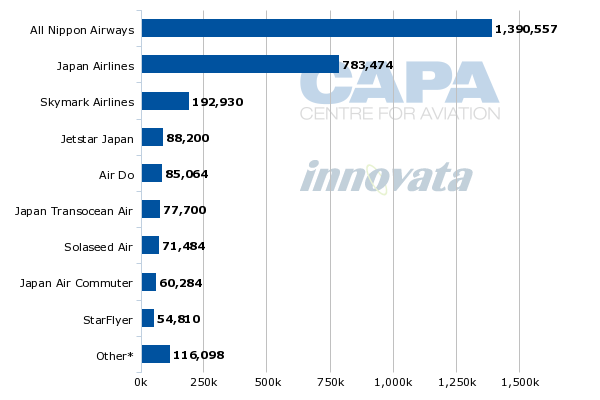 Skymark’s proposition is anchored around its legacy incumbents having bloated cost bases (so high that JAL entered bankruptcy – one of the few outside of the US) and operating densely configured aircraft, albeit with low load factors by world standards. 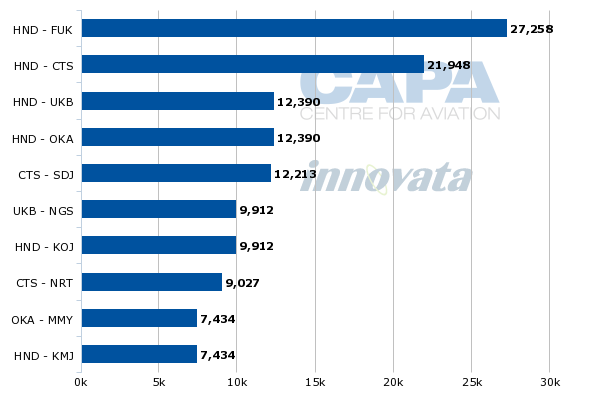 It is difficult to find a market with remotely similar characteristics; elsewhere incumbents have a more competitive cost base to new entrants that would pose a challenge to achieving a yield advantage on an all-premium aircraft. Skymark is also working with scale, operating in the world’s third-largest domestic market. While India and Indonesia will likely one day surpass Japan’s domestic size, those markets will still be extremely price sensitive. But perhaps there will be an opportunity, and no doubt further carriers will attempt to find such a sweet spot. For consumers craving differentiation, the added price may be justifiable, in turn stimulating higher load factors and, perhaps, lower fares! At least, that is where Skymark will be aiming.